This eye disease occurs when there are changes to the macula, a small portion of the retina that is located on the inside back layer of the eye. AMD is a loss of central vision that can occur in two forms: “dry” (atrophic) and “wet” (exudative). 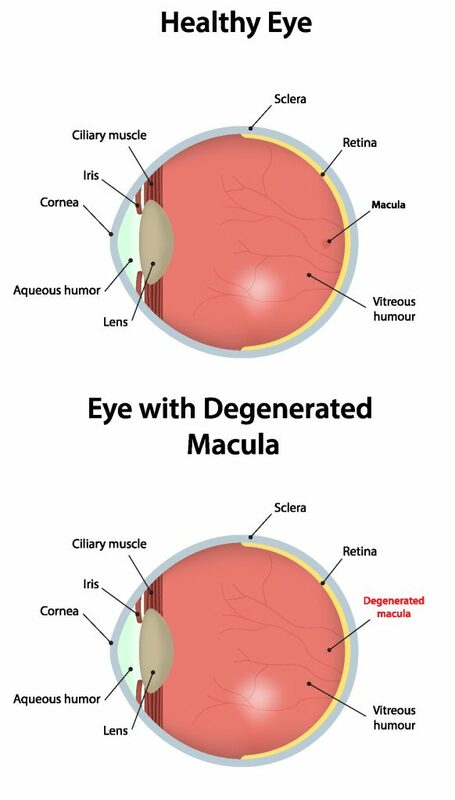 With “dry” macular degeneration, the tissue of the macula gradually becomes thin and stops working properly. There is no cure for dry AMD, and any loss in central vision cannot be restored. Less common, “wet” macular degeneration occurs when fluids leak from newly formed blood vessels under the macula. This leakage blurs central vision. Vision loss can be rapid and severe. Researchers have linked eye-friendly nutrients such as lutein and zeaxanthin, vitamin C, vitamin E and zinc to reducing the risk of certain eye diseases, including macular degeneration. For more information on the importance of good nutrition and eye health, please see the American Optometric Association website. To schedule an appointment with Dr. Roger Weikum or Dr. Tyah Johnson, click on the button below or call (214) 220-2425. We have two convenient locations to serve you in Downtown Dallas or Irving, Texas. To schedule an appointment, click on the button below or call (214) 220-2425. We have two convenient locations to serve you in Downtown Dallas or Irving, Texas.